Here are a couple more circle swing cards that I made for Card Care Connection (see my post here about this wonderful organization that collects homemade cards to send to cancer patients upon request by family and friends). These are very quick to make! 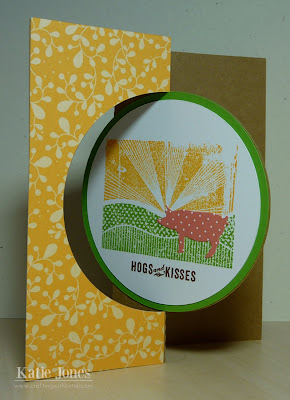 This one features a cute background and sentiment from Papertrey Ink's On the Farm stamp set, with a pig cut from the On the Farm die. 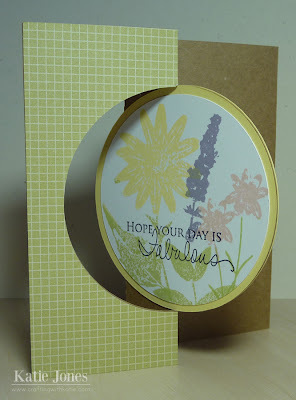 I stamped the sentiment, duck, and ducklings using more On the Farm stamps. For this one, I stamped a pretty floral background using Papertrey Ink's Wildflowers stamp set, with a sentiment from Signature Greetings. Be sure to stop by tomorrow. I'll be sharing my first post for the the Jinger Adams Design Team! 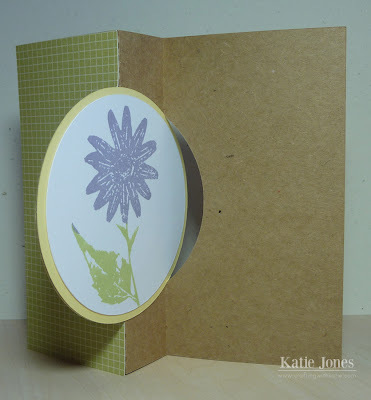 Katie ~ Well dang ~ I LOVE these cards! What a fun shape! I know I said that before but I really LOVE these!! Especially the paper!!! Okay and the farm animals too! LOL! You know you used one of my favorite stamps from PTI on the second card! BEAUTIFULLY done!! I will be back tomorrow to see your 1st post for Jinger! Can't wait!!! Nice cards...These cards look like a lot of fun to make.